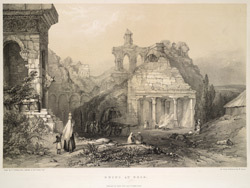 This is plate 7 from HH Wilson's 'The Oriental Portfolio'. Wilson describes the town shortly after its capture by the British in 1804: "Deeg possessed a considerable population and could boast many large edifices belonging to persons of rank, besides the palace of the Raja, which was then a spacious and handsome structure. It had, however, declined from its former prosperity, and subsequent events have accelerated the progress of decay, so that at present it is still described as a wild scene of desolation …[however] there are many beautiful specimens of its former grandeur ... The ruinous condition of Deeg is not attributable merely to the effects of time and decay. In the perpetual succession of political intrigue and conflict which convulsed the reigns of the last Mogul kings. Deeg was repeatedly visited by the destructive violence of war."